The Bakehouse Grain Commission project—the undertaking of on-site milling of grains at Zingerman’s Bakehouse—has been one of the most inspiring improvements we’ve made in the last year! The difference in flavor in the breads and pastries that use the freshly-milled grain has been remarkable—what was already exceptional has become amazing. You can taste the difference in the Country Miche, Margaret’s Sweet Wheat, our rye breads, the Roadhouse bread, the Funky Chunky Chocolate cookies, and the Michigan Double cookies have all gotten even better by being made partially or exclusively with grain milled right at Zingerman’s Bakehouse. The German Vollkornbrot is now at the top of that list. As baker Hazim Tugun writes, “Part of the Zingerman’s ethos is ‘constant improvement,’ and we believed this bread could be revised to have improved flavor and texture.” The new and improved Vollkornbrot (which, in German, means simply “whole grain bread”) is made using organic rye that we’re getting from Breslin Farms in Ottawa, Illinois. Ottawa, if you don’t know the town, is about a 90-minute drive southwest from Chicago. Back in the mid-19th century it was an important stop on the Underground Railroad, and the site of the first Lincoln-Douglas debate during the 1858 Illinois Senatorial campaign. More in the moment, Breslin Farms does all kinds of great things—it’s family owned, organic, focused on biodiversity, grows for flavor, and is committed to helping create a healthy local ecosystem. (If you’re interested in any or all of that, they have a great reading list on their website.) The Breslin’s whole rye is stone milled fresh at the Bakehouse. Our mixers take that fresh rye and start a sour from rye chops, sunflower seeds, and more whole grain rye flour—the natural fermentation goes for at least 12 hours. As per German baking tradition, the crew waits 24 hours to allow the loaves to “cure” and set up after the newly-baked bread comes out of the ovens. 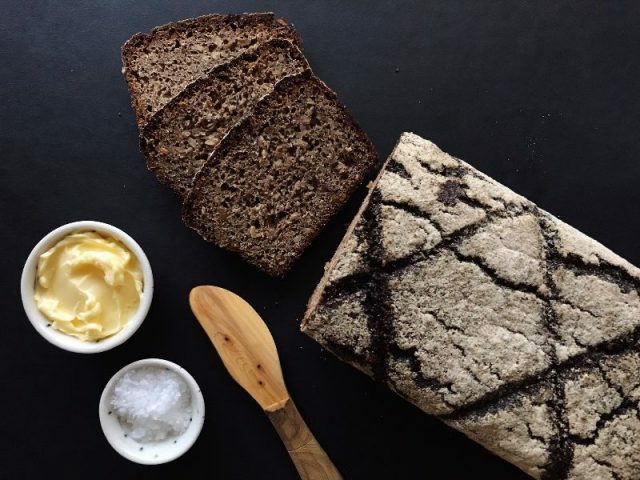 Try Vollkornbrot at the Deli! Sign Up For Ari’s Top 5 Enews!